Analytics touch every part of an organization. From operations, to marketing, to delivery and legal, every department needs data to maximize its own impact. According to Forrester Research, approximately 74% of organizations want to be “data-driven,” yet only 29% are good at connecting insights to action.¹ That’s because most organizations don’t have proper access to their data and proper context. Improving enterprise-wide data understanding among business users to turn data into actionable business insights is the goal of every organization seeking a competitive advantage. That said, with data being collected, shared and deployed at today’s rapid pace, IT is often the only organizational department equipped to manage the preparation of massive data volumes. At the end of the day, business users are all too often left confused and confounded by IT’s technical tools and lingo. Data is a commodity, but it can only become a valuable asset if the business community can transform it into meaningful business insights and improved outcomes. Given the volume and velocity of data today, organizations can no longer afford to leave business users solely dependent upon IT for the data they need. This scenario is exacerbated by a constant and recurring IT/Business disconnect: IT generally doesn’t understand the data required by each business function, and business users typically lack the technical expertise to translate IT data tools into clear analysis in a business context. Ensuring success with enterprise data requires the formal alignment of divergent lines of business, technology and business processes through data governance to create a comprehensive data catalog. An enterprise data catalog organizes the technical details around data assets, or metadata, into defined, meaningful and searchable business assets to enable consistent understanding among all data consumers. Enterprise data cataloging is an essential component for a modern analytics initiative because it synthesizes all the details about an organization’s data assets across multiple data sources by organizing them into a simple, easy to digest format. The data catalog provides clarity into data definitions, synonyms and essential business attributes so all users understand and can leverage their data as an asset. It also identifies data owners, stewards, and subject matter experts, so business users know where to go when they have important data questions—enabling easy collaboration across different departments. A data catalog can also provide business lineage to give business users a clear understanding of the flow and dependencies of their data, from origination and throughout the data supply chain. 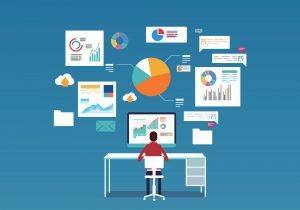 Finally, an analytics modernization initiative is more than simply having a data catalog solution. It must be part of the complete end-to-end analytics process, where an organization begins to measure discovery-to-insight as part of the value chain. When a data catalog solution, a data governance integration platform and analytics tools are implemented together with a modern data warehouse or data lake in the cloud…you’re talking complete analytics modernization and maximum value to your organization. Contact Infoverity today if you’re interested in discussing a data governance strategy for your organization and how to select an enterprise data catalog that will best suit your company’s needs for maximum organizational impact. Founded in 2011, Infoverity is a leading systems integrator and global provider of Master Data Management (MDM), Product Information Management (PIM) strategy and implementation, data governance and analytics, managed services and hosting solutions that help large enterprises in the retail, consumer goods, manufacturing, financial and healthcare sectors to simplify and maximize the value of their information. Infoverity, a 100% employee-owned company, is on the Inc. 5000, is recognized by IDG’s Computerworld as one of the Best Places to Work in IT, as a Wonderful Workplace for Young Professionals and as a Best Place to Work by Business First. Infoverity’s global headquarters is in Dublin, Ohio, the EMEA headquarters is in Valencia, Spain and additional offices are located in the United Kingdom, France, Germany and Russia. For more information on Infoverity solutions, visit Infoverity.com, follow @Infoverity on Twitter, or contact us today.